To understand the market, the report is categorically split into three sections viz. market analysis by product type, application, end users and region. With the rising trend of non-invasive surgical methods, the demand for thread lifting procedures is increasing. 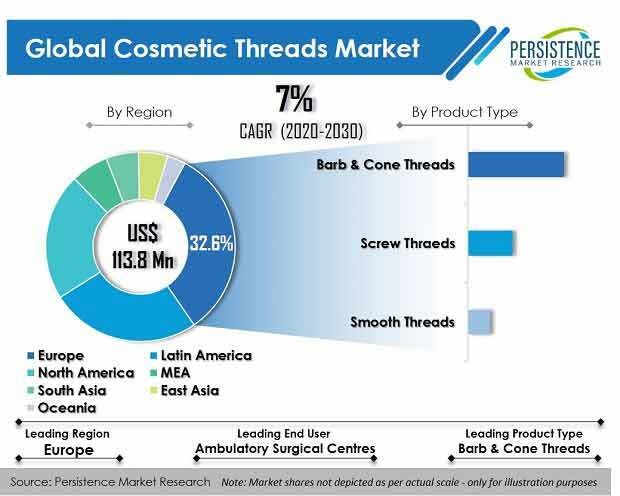 The cosmetic threads market accounted a value of US $84.5 Mn in 2017 and is projected to grow at a CAGR of 7.4% over the forecast period. The cosmetic threads market comprises companies operating at regional as well as international levels. The growth of the cosmetic threads market is dependent on the adoption rate of the procedure and launch of new safe, effective and economical products. Europe is expected to hold maximum share in the global cosmetic threads market in terms of value followed by the Latin America as the product has been in these markets for a long time. These both regions are established markets for cosmetic threads. North America is expected to grow at a significant CAGR over the forecast period due of the recent FDA approval for the technique and growing traction for the minimal invasive procedures. This is followed by Asia-Pacific as the region has presence of numerous cosmetic thread manufactures and is witnessing significant growth in the aesthetic industry. The MEA is expected to account for low market share as well as growth rate over the forecast period.